Gujarat State Tribal Education Society (GSTES) or EMRS Society came into existence on 3rd January, 2000 as an autonomous society by Tribal Development Department, Government of Gujarat registered under The Bombay Public Trust Act, 1950 vide Registration No. F/676/Gandhinagar. 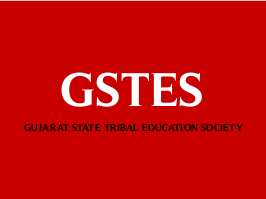 The name of GSTDREIS has changed to 'Gujarat State Tribal Education Society' (GSTES) since 11-Feb-2015. GSTES is formed for establishing, maintaining, controlling and managing good quality schools for talented and meritorious ST students. Education Qualification: Candidate must hold Qualification of Post Graduate with any subjects with B.Ed. Or you must have B.P.Ed. or Any Graduate with B.Ed. or B.P.Ed. Candidates have a chance who have M.ed with any subjects from any University/Institution Approved Under Govt of India. Selection is through Academic Marks, Merit List and Interview. Candidates need to fill the GSTES Online Application Form at eklavya-education.gujarat.gov.in. Applicant must fill the details of Education, Age, etc. Remember to affix the Passport Size Photo with Signature. Submit the form from 1st to 15 June.